This weekend, we gave Top Gear executive producer Andy Wilman a chance to rebut the PR campaign by Tesla Motors over their lawsuit of the BBC program. Today, we give you the response by Tesla Motors. —Ed. On March 29 2011, Tesla filed a lawsuit to stop Top Gear's continued rebroadcasts of an episode containing malicious falsehoods about the Tesla Roadster. Top Gear's Executive Producer, Andy Wilman, has drafted a blog to present their side of the story. Like the episode itself, however, his proclamations do more to confound than enlighten. Mr. Wilman admits that Top Gear wrote the script before filming the testing of the Roadsters. The script in question, concluding with the line "in the real world, it absolutely doesn't work" was lying around on set while Top Gear was allegedly "testing" the Roadsters. It seems actual test results don't matter when the verdict has already been given — even if it means staging tests to meet those predetermined conclusions. Now Mr. Wilman wants us to believe that when Top Gear concluded that the Roadster "doesn't work," it "had nothing to do with how the Tesla performed." Are we to take this seriously? According to Mr. Wilman, when Top Gear said the car "doesn't work," they "primarily" meant that it was too expensive. Surely they could have come to that conclusion without staging misleading scenes that made the car look like it didn't work. Mr. Wilman's other contentions are just as disingenuous. He states that they never said the Roadster "ran out of charge." If not, why were four men shown pushing it into the hangar? 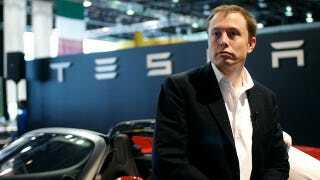 Mr. Wilman states that "We never said that the Tesla was completely immobilized as a result of the motor overheating." If not, why is the Roadster depicted coming to a stop with the fabricated sound effect of a motor dying? Mr. Wilman also objects to Tesla explaining our case, and the virtues of the Roadster. Top Gear has been re-broadcasting lies about the Roadster for years, yet are uncomfortable with Tesla helping journalists set the record straight about the Roadster's revolutionary technology. Mr. Wilman seems to want Top Gear to be judged neither by what it says, nor by what it does. Top Gear needs to provide its viewers, and Tesla, straightforward answers to these questions. This post was originally printed on Tesla Motors' forum.